When it comes to landscaping, you can achieve hundreds of designs by simply using artificial turf. Gretna homeowners who want to have a lush, green lawn without having to do any gardening can do so by getting artificial turf in Gretna from Heroes Lawn and Landscape. Whether you’re building an eye-catching front yard to impress your guests, or a simple backyard where you can bond with your family, one of the best landscaping solutions is to get artificial turf. Gretna homeowners can learn more about artificial turf in Gretna by visiting the rest of our website. Before ordering artificial turf, Gretna homeowners should form at least an idea of the design they want. If you’re not entirely sure of what landscaping design to do with your artificial turf, Gretna homeowners can simply ask Heroes Lawn and Landscape. In fact, through the years, we have prepared hundreds of artificial turf in Gretna. To get an idea of our excellence, feel free to browse through our gallery of finished artificial turf. Gretna homes have been beautified and made more stunning with the aid of our landscaping solutions. After deciding on a landscaping design, you can begin shopping for artificial turf in Gretna. Your next task is to determine what makes good artificial grass. Luckily, when it comes to artificial turf, Gretna homeowners can rest easy knowing that they’re purchasing top-notch landscaping products from Heroes Lawn and Landscape. Here are some of the reasons why our artificial turf in Gretna is among the best in the area. Color: You may think the best artificial turf in Gretna is the one that’s greenest in color, but that may not be the case all the time. To get a more natural look, it’s best to go with artificial turf in Gretna that has a touch of brown. If you decide to go with bright green grass, you may end up with a plastic look instead of an earthy vibe. Texture: Good artificial turf in Gretna is soft and non-abrasive. You and your family will enjoy lounging around your lawn for extended hours. A lot of time will be spent running and rolling around your lawn. If your artificial turf in Gretna is coarse, it may cause skin irritation to your children. Pet-Friendly: Nothing beats running around with your and pets in your yard. You can play a game of fetch, tag, do tricks, or simply run around with your beloved pets. If you want to have days like these, make sure to go with pet-friendly artificial turf in Gretna. Satisfaction: Until your artificial turf in Gretna is 100% perfect, we will continue to work and correct it as needed. Accountability: When it comes to the installation of landscape products such as artificial turf, Gretna homeowners can be at ease knowing that we do exactly what we say. If we say that we will deliver only the finest artificial turf in Gretna, then you can expect to see it by the time we’re done working. Transparency: After the completion of the artificial turf, Gretna homeowners will receive 100% accurate project statements. All of our projects starts with the dissemination of correct project statements for transparency. 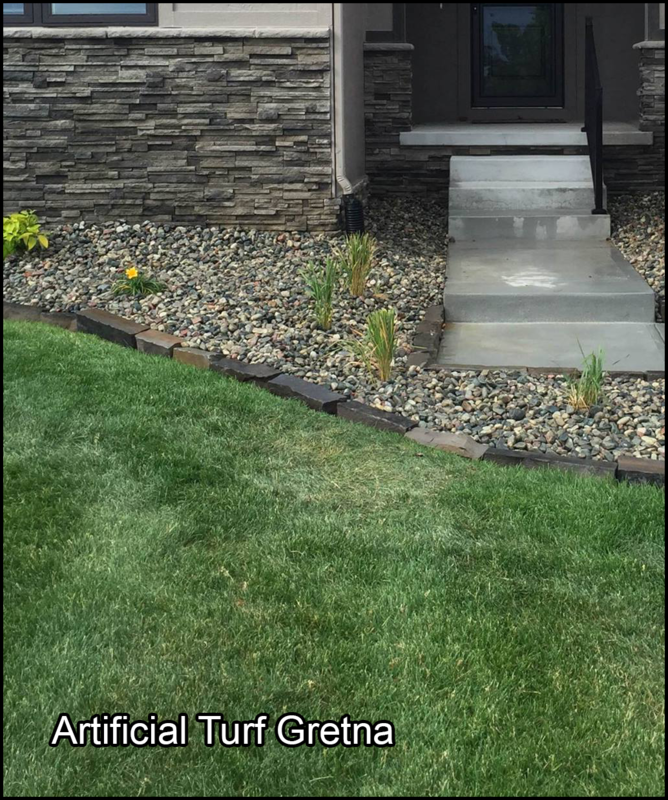 Get Artificial Turf in Gretna Today! When looking for a place to get artificial turf in Gretna, make sure to check out Heroes Lawn and Landscape. We are professional contractors providing everything from lawn maintenance to outdoor living space construction. We go the extra mile to ensure that we meet all of our clients’ needs. Read more for information about our services. Learn more here: https://www.hgtv.com/design/outdoor-design/landscaping-and-hardscaping/faking-it-with-artificial-turf-options-pictures. Do you want a new look for your outdoor spaces? Turn to Heroes Lawn and Landscape for expert landscape design and maintenance services. Our team has the service, skills, experience, and equipment to implement a full-scale landscape design project for residential and commercial clients. We meet with our clients first so we can fully understand their goals. Also, we provide regular updates throughout the course of the project to ensure that our clients and our team are on the same page. Our seasoned installation crew will deftly and efficiently bring your plan to fruition. Afterward, you can opt for our maintenance service to ensure that your landscape’s features look as amazing as the day they were installed. Learn more about how we can transform your outdoor spaces into showcases by giving us a call. You may also request a quote by filling out our online form. We look forward to helping you achieve the lawn or yard of your dreams with artificial turf Gretna.